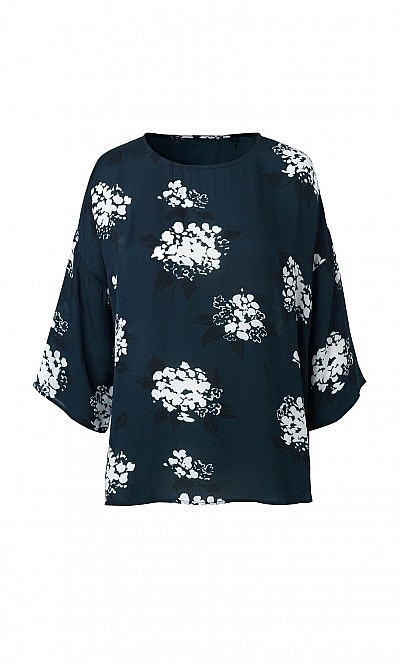 Floral top in dark blue with scooped hem and elbow-length sleeves. Wide, fluid cut. L60cm. Viscose. Cool wash. Pretty Print, lovely feel - feels like you are nearing almost nothing. A bit cool for November but is great in over-heated workplaces. A bit disapponted with the pattern distribution on my version, not nearly as flattering as the catalogue pic - but that’s what you get when buying before seeing the actual item.